Toutes vos marques a trouvé 9 boutique(s) correspondant à la marque GIORGIO ARMANI, à la catégorie Chaussures . Toutes vos marques, vos boutiques de vêtements de marques tendance, de chaussures à la mode et d'accessoires branchés : toutesvosmarques. "www.toutesvosmarques.com" a trouvé 9 boutique(s) correspondant à la marque GIORGIO ARMANI, à la catégorie Chaussures. Giorgio Armani, 74, is the President and Chief Executive Officer of the Armani Group and sole share holder of Giorgio Armani S.p.A., one of the world’s leading fashion and lifestyle design houses, with 5,000 direct employees, 13 factories, and a direct network of 500 exclusive retail stores in 46 countries worldwide. Under Mr. Armani’s direction, Giorgio Armani S.p.A. today stands as one of the few remaining independent, privately-owned companies in its sector, with a proven business strategy that has capitalised on the worldwide power and potential of the Armani brand name. Born on July 11, 1934, Giorgio Armani grew up with his sister and brother in the northern Italian town of Piacenza. In 1957, following two years of study in medicine at the University of Piacenza, Giorgio Armani decided to leave in order to pursue his interest in fashion, accepting a job as a merchandiser at Milan’s well-known department store, La Rinascente. Thereafter, Mr. Armani worked as a fashion designer for Nino Cerruti, and then as a freelance designer for various companies, an experience that resulted in an exceptionally rich and varied evolution of his style. After several years of working as a freelance designer, Mr. Armani was ready to devote his energy to his own label and followed his friend Sergio Galeotti’s suggestion that they open a company together. On July 24, 1975, the two business partners founded Giorgio Armani S.p.A. and launched a men’s and women’s ready-to-wear line. Mr. Armani’s philosophy of fashion and style, together with his entrepreneurial ability, has been central to the success of Giorgio Armani S.p.A. He oversees both the company’s strategic direction and all aspects of design and creativity. Perhaps best known for revolutionising fashion with his unstructured jacket in the Eighties, after thirty years of running his own label, he now presides over a stable of collections, including his signature Giorgio Armani line, Giorgio Armani Privé, Armani Collezioni, Emporio Armani, AJ | Armani Jeans, A/X Armani Exchange, Armani Teen, Armani Junior, Armani Baby, and Armani Casa home interiors, offering a choice of lifestyles to the marketplace. Today, the company’s product range includes women’s and men’s clothing, shoes and bags, watches, eyewear, jewellery, fragrances and cosmetics, and home furnishings. In May 2005 Giorgio Armani S.p.A. signed an agreement with Emaar Properties to create a series of Armani Hotels & Resorts. Under the terms of this agreement Giorgio Armani undertook responsibility for originating and implementing design concepts that would define the style and mood of a new international chain of hotels, resorts and luxury residences scheduled to open in the world’s leading cities and tourist destinations. Elegance and harmony were to be the keynotes of the project, offering guests the opportunity to enjoy a total experience rooted in the Armani lifestyle. The first of these Armani hotels will open in Dubai during 2009, and will be followed by another in Milan in 2010. During his career Mr. Armani has received many local and international awards. These include the Commendatore dell’Ordine al Merito della Repubblica, and Grand’Ufficiale dell’Ordine al Merito della Repubblica (Italy’s highest government awards), and the Award for Best International Designer, Lifetime Achievement Award for men’s wear and for art and fashion from the Council of Fashion Designers of America. He has, in addition, been recognised with an Honorary Doctorate from London’s Royal College of Art, and has an Honorary Degree from Milan’s Accademia di Brera. In 2006 he was awarded an Honorary Degree from London’s Central Saint Martins College of Art and Design, and in 2007 he received an Honorary Degree in Industrial Design from the Politecnico University of Milan. Mr. Armani has served as Goodwill Ambassador for the United Nations High Commission for Refugees. In 2003 he was honoured with the inaugural Rodeo Drive “Walk of Style” Award for his pioneering role in bringing the worlds of fashion and cinema together. In 2006, Giorgio Armani was honoured with other important awards: from the Dino Ferrari award for being the most renowned fashion designer in the world, to the Elle Award given to Mr. Armani in Valencia, and the “Leonardo Award” presented to Mr Armani by the Italian Presidente della Repubblica, Giorgio Napolitano, in recognition of his status as a major representative of “Italian Quality” worldwide. In 2008, in Paris, the President of the French Republic, Nicholas Sarkozy, conferred the order of the Légion d’Honneur on the designer. In 2000, New York’s Solomon R. Guggenheim Museum celebrated the social and cultural influence of Mr. Armani’s career, placing special emphasis on his pioneering design work for the cinema, by staging an exhibition that has since been seen at some of the world’s most prestigious museums, including the Guggenheim Bilbao, London’s Royal Academy of Arts, Berlin’s Neue Nationalgalerie, Rome’s Terme di Diocleziano, Tokyo’s Mori Arts Museum and Shanghai’s Shanghai Art Museum. On February 20th, 2007, the exhibition reached its eighth venue at the Triennale di Milano in an expanded and enriched version with a striking new display over two floors. In 2005, Giorgio Armani presented his first collection of haute couture, Giorgio Armani Privé, in response to requests from clients who were seeking exclusive clothes of the very highest standard, fulfilling all the criteria of fine bespoke tailoring. In 2006, Giorgio Armani went to the World Economic Forum in Davos to personally announce his support for (PRODUCT) RED, the pioneering global initiative founded by Bono and Bobby Shriver to fight AIDS in Africa. In 2007, on the occasion of the 79th Annual Academy Awards, Giorgio Armani presented an exclusive showing of his new Haute Couture Giorgio Armani Privé Spring/Summer 2007 collection to a specially invited audience in the grounds of Ron Burkle’s Green Acres Estate in Beverly Hills. The following day he attended the Oscars. At the end of 2007, Mr. Armani travelled to Tokyo for the opening of the Armani/Ginza Tower, his fourth concept store after Milan’s Armani/Manzoni 31, Munich’s Armani/Theatiner 12, and Hong Kong’s Armani/Chater House. The Armani/Ginza Tower features magnificent spaces in which the complete Armani fashion and lifestyle philosophy can be discovered under a single roof. Armani/ 5th Avenue is the next scheduled concept store. It will be opened in New York during 2009. Toutes vos marques a trouvé 9 boutique(s) correspondant à la marque GIORGIO ARMANI, à la catégorie Chaussures . toutesvosmarques.com est le numéro 1 de la recherche de boutique de mode sur Internet. 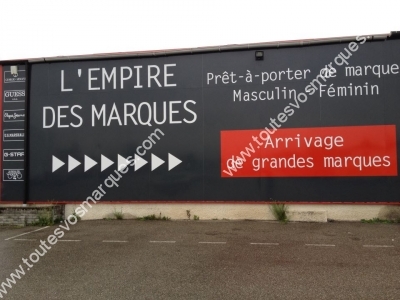 Avec plus de 50000 boutiques partenaires en France, plus de 2000 marques référencées et plus de 5000 visites par jour, toutesvosmarques.com est en pole position des recherches d'une marque dans une ville sur les principaux moteurs de recherche. Les boutiques de la marque GIORGIO ARMANI - les points de ventes de la marque GIORGIO ARMANI - les revendeurs de la marque GIORGIO ARMANI - les magasins de la marque GIORGIO ARMANI - les dépositaires de la marque GIORGIO ARMANI - les enseignes de la marque GIORGIO ARMANI - où acheter la marque GIORGIO ARMANI - Accessoires de mode GIORGIO ARMANI, Articles sport, nature, rando GIORGIO ARMANI, BEAUTE GIORGIO ARMANI, Bien être GIORGIO ARMANI, BIJOUTERIE FANTAISIE GIORGIO ARMANI, BIJOUTERIE, JOAILLERIE GIORGIO ARMANI, Chapeaux GIORGIO ARMANI, Chaussettes, Collants, Bas GIORGIO ARMANI, Chaussures GIORGIO ARMANI, Chaussures ado GIORGIO ARMANI, Chaussures de sport GIORGIO ARMANI, Chaussures enfants GIORGIO ARMANI, Chaussures femmes GIORGIO ARMANI, Chaussures hommes GIORGIO ARMANI, Costumes et complets GIORGIO ARMANI, Couture et sur mesure GIORGIO ARMANI, Créateur prêt à porter GIORGIO ARMANI, Divers GIORGIO ARMANI, Jeannerie streetwear GIORGIO ARMANI, Ligne confort GIORGIO ARMANI, Ligne de bain GIORGIO ARMANI, Linge de maison GIORGIO ARMANI, Lingerie femme GIORGIO ARMANI, MAROQUINERIE ET ARTICLES DE VOYAGE GIORGIO ARMANI, Robes de mariées GIORGIO ARMANI, Sous vêtements homme GIORGIO ARMANI, Vente en ligne GIORGIO ARMANI, Vêtement femme GIORGIO ARMANI, Vêtement homme GIORGIO ARMANI, Vêtements baby GIORGIO ARMANI, Vêtements danse GIORGIO ARMANI, VETEMENTS DE TRAVAIL GIORGIO ARMANI, Vêtements kids GIORGIO ARMANI, Vêtements ligne ados GIORGIO ARMANI, Vêtements sport et nature GIORGIO ARMANI - GIORGIO ARMANI en Champagne-Ardenne, GIORGIO ARMANI en Basse-Normandie, GIORGIO ARMANI en Poitou-Charentes, GIORGIO ARMANI en Bourgogne, GIORGIO ARMANI en Bretagne, GIORGIO ARMANI en Franche-Comté, GIORGIO ARMANI en Haute-Normandie, GIORGIO ARMANI en Centre, GIORGIO ARMANI en Languedoc-Roussillon, GIORGIO ARMANI en Midi-Pyrénées, GIORGIO ARMANI en Lorraine, GIORGIO ARMANI en Nord-Pas-de-Calais, GIORGIO ARMANI en Auvergne, GIORGIO ARMANI en Aquitaine, GIORGIO ARMANI en Alsace, GIORGIO ARMANI en Pays de la Loire, GIORGIO ARMANI en Rhône-Alpes, GIORGIO ARMANI en Ile-de-France, GIORGIO ARMANI en Picardie, GIORGIO ARMANI en Provence-Alpes-Côte d'Azur, GIORGIO ARMANI en Limousin - GIORGIO ARMANI dans le(s) Ain , GIORGIO ARMANI dans le(s) Aisne , GIORGIO ARMANI dans le(s) Allier , GIORGIO ARMANI dans le(s) Alpes de Hautes-Provence , GIORGIO ARMANI dans le(s) Hautes-Alpes , GIORGIO ARMANI dans le(s) Alpes-Maritimes , GIORGIO ARMANI dans le(s) Ardèche , GIORGIO ARMANI dans le(s) Ardennes , GIORGIO ARMANI dans le(s) Ariège , GIORGIO ARMANI dans le(s) Aube , GIORGIO ARMANI dans le(s) Aude , GIORGIO ARMANI dans le(s) Aveyron , GIORGIO ARMANI dans le(s) Bouches-du-Rhône , GIORGIO ARMANI dans le(s) Calvados , GIORGIO ARMANI dans le(s) Cantal , GIORGIO ARMANI dans le(s) Charente , GIORGIO ARMANI dans le(s) Charente-Maritime , GIORGIO ARMANI dans le(s) Cher , GIORGIO ARMANI dans le(s) Corrèze , GIORGIO ARMANI dans le(s) Côte-d'Or , GIORGIO ARMANI dans le(s) Côtes d'Armor , GIORGIO ARMANI dans le(s) Creuse , GIORGIO ARMANI dans le(s) Dordogne , GIORGIO ARMANI dans le(s) Doubs , GIORGIO ARMANI dans le(s) Drôme , GIORGIO ARMANI dans le(s) Eure , GIORGIO ARMANI dans le(s) Eure-et-Loir , GIORGIO ARMANI dans le(s) Finistère , GIORGIO ARMANI dans le(s) Gard , GIORGIO ARMANI dans le(s) Haute-Garonne , GIORGIO ARMANI dans le(s) Gers , GIORGIO ARMANI dans le(s) Gironde , GIORGIO ARMANI dans le(s) Hérault , GIORGIO ARMANI dans le(s) Ille-et-Vilaine , GIORGIO ARMANI dans le(s) Indre , GIORGIO ARMANI dans le(s) Indre-et-Loire , GIORGIO ARMANI dans le(s) Isère , GIORGIO ARMANI dans le(s) Jura , GIORGIO ARMANI dans le(s) Landes , GIORGIO ARMANI dans le(s) Loir-et-Cher , GIORGIO ARMANI dans le(s) Loire , GIORGIO ARMANI dans le(s) Haute-Loire , GIORGIO ARMANI dans le(s) Loire-Atlantique , GIORGIO ARMANI dans le(s) Loiret , GIORGIO ARMANI dans le(s) Lot , GIORGIO ARMANI dans le(s) Lot-et-Garonne , GIORGIO ARMANI dans le(s) Lozère , GIORGIO ARMANI dans le(s) Maine-et-Loire , GIORGIO ARMANI dans le(s) Manche , GIORGIO ARMANI dans le(s) Marne , GIORGIO ARMANI dans le(s) Haute-Marne , GIORGIO ARMANI dans le(s) Mayenne , GIORGIO ARMANI dans le(s) Meurthe-et-Moselle , GIORGIO ARMANI dans le(s) Morbihan , GIORGIO ARMANI dans le(s) Moselle , GIORGIO ARMANI dans le(s) Nièvre , GIORGIO ARMANI dans le(s) Nord , GIORGIO ARMANI dans le(s) Oise , GIORGIO ARMANI dans le(s) Orne , GIORGIO ARMANI dans le(s) Pas-de-Calais , GIORGIO ARMANI dans le(s) Puy-de-Dôme , GIORGIO ARMANI dans le(s) Pyrénées-Atlantiques , GIORGIO ARMANI dans le(s) Hautes-Pyrénées , GIORGIO ARMANI dans le(s) Pyrénées-Orientales , GIORGIO ARMANI dans le(s) Bas-Rhin , GIORGIO ARMANI dans le(s) Haut-Rhin , GIORGIO ARMANI dans le(s) Rhône , GIORGIO ARMANI dans le(s) Haute-Saône , GIORGIO ARMANI dans le(s) Saône-et-Loire , GIORGIO ARMANI dans le(s) Sarthe , GIORGIO ARMANI dans le(s) Savoie , GIORGIO ARMANI dans le(s) Haute-Savoie , GIORGIO ARMANI dans le(s) Paris , GIORGIO ARMANI dans le(s) Seine-Maritime , GIORGIO ARMANI dans le(s) Seine-et-Marne , GIORGIO ARMANI dans le(s) Yvelines , GIORGIO ARMANI dans le(s) Deux-Sèvres , GIORGIO ARMANI dans le(s) Somme , GIORGIO ARMANI dans le(s) Tarn , GIORGIO ARMANI dans le(s) Tarn-et-Garonne , GIORGIO ARMANI dans le(s) Var , GIORGIO ARMANI dans le(s) Vaucluse , GIORGIO ARMANI dans le(s) Vendée , GIORGIO ARMANI dans le(s) Vienne , GIORGIO ARMANI dans le(s) Haute-Vienne , GIORGIO ARMANI dans le(s) Vosges , GIORGIO ARMANI dans le(s) Yonne , GIORGIO ARMANI dans le(s) Territoire-de-Belfort , GIORGIO ARMANI dans le(s) Essonne , GIORGIO ARMANI dans le(s) Hauts-de-Seine , GIORGIO ARMANI dans le(s) Seine-Saint-Denis , GIORGIO ARMANI dans le(s) Val-de-Marne , GIORGIO ARMANI dans le(s) Val-d'Oise -GIORGIO ARMANI dans le Sud Ouest, GIORGIO ARMANI dans le Nord Est, GIORGIO ARMANI dans le Paris / Ile-de-France, GIORGIO ARMANI dans le Sud Est - GIORGIO ARMANI à BOURG EN BRESSE, GIORGIO ARMANI à OYONNAX, GIORGIO ARMANI à FERNEY VOLTAIRE, GIORGIO ARMANI à DIVONNE LES BAINS, GIORGIO ARMANI à AMBERIEU EN BUGEY, GIORGIO ARMANI à BEYNOST, GIORGIO ARMANI à THOIRY, GIORGIO ARMANI à LAON, GIORGIO ARMANI à SAINT QUENTIN, GIORGIO ARMANI à SOISSONS, GIORGIO ARMANI à MOULINS, GIORGIO ARMANI à MONTLUCON, GIORGIO ARMANI à VICHY, GIORGIO ARMANI à DIGNE LES BAINS, GIORGIO ARMANI à MANOSQUE, GIORGIO ARMANI à GAP, GIORGIO ARMANI à NICE, GIORGIO ARMANI à GRASSE, GIORGIO ARMANI à VENCE, GIORGIO ARMANI à MANDELIEU LA NAPOULE, GIORGIO ARMANI à LA TRINITE, GIORGIO ARMANI à CANNES, GIORGIO ARMANI à MENTON, GIORGIO ARMANI à ANTIBES JUAN LES PINS, GIORGIO ARMANI à SAINT LAURENT DU VAR, GIORGIO ARMANI à CAGNES SUR MER, GIORGIO ARMANI à ANNONAY, GIORGIO ARMANI à AUBENAS, GIORGIO ARMANI à CHARLEVILLE MEZIERES, GIORGIO ARMANI à SEDAN, GIORGIO ARMANI à FOIX, GIORGIO ARMANI à PAMIERS, GIORGIO ARMANI à SAINT GIRONS, GIORGIO ARMANI à TROYES, GIORGIO ARMANI à SAINT ANDRE LES VERGERS, GIORGIO ARMANI à LA-CHAPELLE-SAINT-LUC, GIORGIO ARMANI à CARCASSONNE, GIORGIO ARMANI à NARBONNE, GIORGIO ARMANI à RODEZ, GIORGIO ARMANI à MILLAU, GIORGIO ARMANI à ONET LE CHATEAU, GIORGIO ARMANI à MARSEILLE, GIORGIO ARMANI à AIX EN PROVENCE, GIORGIO ARMANI à VITROLLES, GIORGIO ARMANI à MIRAMAS, GIORGIO ARMANI à LES PENNES-MIRABEAU, GIORGIO ARMANI à ARLES, GIORGIO ARMANI à SALON DE PROVENCE, GIORGIO ARMANI à AUBAGNE, GIORGIO ARMANI à CABRIES, GIORGIO ARMANI à MARTIGUES, GIORGIO ARMANI à MARIGNANE, GIORGIO ARMANI à CAEN, GIORGIO ARMANI à LISIEUX, GIORGIO ARMANI à HEROUVILLE SAINT CLAIR, GIORGIO ARMANI à BAYEUX, GIORGIO ARMANI à VIRE, GIORGIO ARMANI à DEAUVILLE, GIORGIO ARMANI à AURILLAC, GIORGIO ARMANI à ANGOULEME, GIORGIO ARMANI à COGNAC, GIORGIO ARMANI à CHAMPNIERS, GIORGIO ARMANI à LA ROCHELLE, GIORGIO ARMANI à SAINTES, GIORGIO ARMANI à ROYAN, GIORGIO ARMANI à ROCHEFORT, GIORGIO ARMANI à ANGOULINS, GIORGIO ARMANI à BOURGES, GIORGIO ARMANI à VIERZON, GIORGIO ARMANI à SAINT DOULCHARD, GIORGIO ARMANI à TULLE, GIORGIO ARMANI à BRIVE LA GAILLARDE, GIORGIO ARMANI à USSEL, GIORGIO ARMANI à DIJON, GIORGIO ARMANI à FONTAINE LES DIJON, GIORGIO ARMANI à BEAUNE, GIORGIO ARMANI à CHENOVE, GIORGIO ARMANI à QUETIGNY, GIORGIO ARMANI à SAINT BRIEUC, GIORGIO ARMANI à LEHON, GIORGIO ARMANI à PLERIN, GIORGIO ARMANI à GUINGAMP, GIORGIO ARMANI à LANNION, GIORGIO ARMANI à PERROS GUIREC, GIORGIO ARMANI à GUERET, GIORGIO ARMANI à PERIGUEUX, GIORGIO ARMANI à BERGERAC, GIORGIO ARMANI à SARLAT LA CANEDA, GIORGIO ARMANI à MARSAC SUR L'ISLE, GIORGIO ARMANI à BESANCON, GIORGIO ARMANI à MONTBELIARD, GIORGIO ARMANI à DOUBS, GIORGIO ARMANI à PONTARLIER, GIORGIO ARMANI à VALENCE, GIORGIO ARMANI à ROMANS SUR ISERE, GIORGIO ARMANI à NYONS, GIORGIO ARMANI à MONTELIMAR, GIORGIO ARMANI à BOURG DE PEAGE, GIORGIO ARMANI à PIERRELATTE, GIORGIO ARMANI à EVREUX, GIORGIO ARMANI à PACY SUR EURE, GIORGIO ARMANI à VERNON, GIORGIO ARMANI à BERNAY, GIORGIO ARMANI à LOUVIERS, GIORGIO ARMANI à CHARTRES, GIORGIO ARMANI à DREUX, GIORGIO ARMANI à LUCE, GIORGIO ARMANI à CHATEAUDUN, GIORGIO ARMANI à ANET, GIORGIO ARMANI à QUIMPER, GIORGIO ARMANI à DOUARNENEZ, GIORGIO ARMANI à BREST, GIORGIO ARMANI à CARHAIX PLOUGUER, GIORGIO ARMANI à MORLAIX, GIORGIO ARMANI à CONCARNEAU, GIORGIO ARMANI à NIMES, GIORGIO ARMANI à ALES, GIORGIO ARMANI à BAGNOLS SUR CEZE, GIORGIO ARMANI à TOULOUSE, GIORGIO ARMANI à PORTET SUR GARONNE, GIORGIO ARMANI à FENOUILLET, GIORGIO ARMANI à ROUFFIAC TOLOSAN, GIORGIO ARMANI à MURET, GIORGIO ARMANI à SAINT ORENS DE GAMEVILLE, GIORGIO ARMANI à LABEGE, GIORGIO ARMANI à BLAGNAC, GIORGIO ARMANI à SAINT GAUDENS, GIORGIO ARMANI à AUCH, GIORGIO ARMANI à BORDEAUX, GIORGIO ARMANI à LE BOUSCAT, GIORGIO ARMANI à ARCACHON, GIORGIO ARMANI à BEGLES, GIORGIO ARMANI à SAINT MEDARD EN JALLES, GIORGIO ARMANI à LA TESTE DE BUCH, GIORGIO ARMANI à LORMONT, GIORGIO ARMANI à BIGANOS, GIORGIO ARMANI à LIBOURNE, GIORGIO ARMANI à PESSAC, GIORGIO ARMANI à MERIGNAC, GIORGIO ARMANI à MONTPELLIER, GIORGIO ARMANI à PEZENAS, GIORGIO ARMANI à SAINT AUNES, GIORGIO ARMANI à SETE, GIORGIO ARMANI à SAINT JEAN DE VEDAS, GIORGIO ARMANI à PEROLS, GIORGIO ARMANI à BEZIERS, GIORGIO ARMANI à BALARUC LE VIEUX, GIORGIO ARMANI à LE CRES, GIORGIO ARMANI à LATTES, GIORGIO ARMANI à SAINT CLEMENT DE RIVIERE, GIORGIO ARMANI à RENNES, GIORGIO ARMANI à FOUGERES, GIORGIO ARMANI à SAINT MALO, GIORGIO ARMANI à REDON, GIORGIO ARMANI à PACE, GIORGIO ARMANI à SAINT GREGOIRE, GIORGIO ARMANI à CHATEAUROUX, GIORGIO ARMANI à ISSOUDUN, GIORGIO ARMANI à ARGENTON SUR CREUSE, GIORGIO ARMANI à LE BLANC, GIORGIO ARMANI à LA CHATRE, GIORGIO ARMANI à TOURS, GIORGIO ARMANI à CHINON, GIORGIO ARMANI à LA RICHE, GIORGIO ARMANI à SAINT CYR SUR LOIRE, GIORGIO ARMANI à LOCHES, GIORGIO ARMANI à SAINT PIERRE DES CORPS, GIORGIO ARMANI à GRENOBLE, GIORGIO ARMANI à L'ISLE D'ABEAU, GIORGIO ARMANI à SAINT EGREVE, GIORGIO ARMANI à ECHIROLLES, GIORGIO ARMANI à SALAISE SUR SANNE, GIORGIO ARMANI à VIENNE, GIORGIO ARMANI à TIGNIEU JAMEYZIEU, GIORGIO ARMANI à BOURGOIN JAILLIEU, GIORGIO ARMANI à SAINT MARTIN D'HERES, GIORGIO ARMANI à VOIRON, GIORGIO ARMANI à FONTAINE, GIORGIO ARMANI à CHASSE SUR RHONE, GIORGIO ARMANI à LONS LE SAUNIER, GIORGIO ARMANI à DOLE, GIORGIO ARMANI à MONT DE MARSAN, GIORGIO ARMANI à DAX, GIORGIO ARMANI à BISCARROSSE, GIORGIO ARMANI à BLOIS, GIORGIO ARMANI à VENDOME, GIORGIO ARMANI à ROMORANTIN LANTHENAY, GIORGIO ARMANI à VINEUIL, GIORGIO ARMANI à SAINT ETIENNE, GIORGIO ARMANI à LA RICAMARIE, GIORGIO ARMANI à RIORGES, GIORGIO ARMANI à ROANNE, GIORGIO ARMANI à VILLARS, GIORGIO ARMANI à SAINT CHAMOND, GIORGIO ARMANI à MONTBRISON, GIORGIO ARMANI à FIRMINY, GIORGIO ARMANI à LE PUY EN VELAY, GIORGIO ARMANI à VALS PRES LE PUY, GIORGIO ARMANI à NANTES, GIORGIO ARMANI à ANCENIS, GIORGIO ARMANI à SAINT GEREON, GIORGIO ARMANI à PORNIC, GIORGIO ARMANI à SAINT SEBASTIEN SUR LOIRE, GIORGIO ARMANI à SAINT PHILBERT DE GRAND LIEU, GIORGIO ARMANI à GUERANDE, GIORGIO ARMANI à REZE, GIORGIO ARMANI à SAINT NICOLAS DE REDON, GIORGIO ARMANI à SAINT NAZAIRE, GIORGIO ARMANI à ORVAULT, GIORGIO ARMANI à SAINT HERBLAIN, GIORGIO ARMANI à ORLEANS, GIORGIO ARMANI à SAINT JEAN DE LA RUELLE, GIORGIO ARMANI à MONTARGIS, GIORGIO ARMANI à GIEN, GIORGIO ARMANI à SARAN, GIORGIO ARMANI à CAHORS, GIORGIO ARMANI à FIGEAC, GIORGIO ARMANI à AGEN, GIORGIO ARMANI à BOE, GIORGIO ARMANI à MENDE, GIORGIO ARMANI à ANGERS, GIORGIO ARMANI à CHEMILLE, GIORGIO ARMANI à CHOLET, GIORGIO ARMANI à SAUMUR, GIORGIO ARMANI à DOUE LA FONTAINE, GIORGIO ARMANI à CHERBOURG EN COTENTIN, GIORGIO ARMANI à CHALONS EN CHAMPAGNE, GIORGIO ARMANI à REIMS, GIORGIO ARMANI à EPERNAY, GIORGIO ARMANI à VITRY LE FRANCOIS, GIORGIO ARMANI à CORMONTREUIL, GIORGIO ARMANI à TINQUEUX, GIORGIO ARMANI à CHAUMONT, GIORGIO ARMANI à SAINT DIZIER, GIORGIO ARMANI à LANGRES, GIORGIO ARMANI à LAVAL, GIORGIO ARMANI à SAINT BERTHEVIN, GIORGIO ARMANI à NANCY, GIORGIO ARMANI à HOUDEMONT, GIORGIO ARMANI à TOUL, GIORGIO ARMANI à LUNEVILLE, GIORGIO ARMANI à MONCEL LES LUNEVILLE, GIORGIO ARMANI à FROUARD, GIORGIO ARMANI à LONGWY, GIORGIO ARMANI à TOMBLAINE, GIORGIO ARMANI à LAXOU, GIORGIO ARMANI à VANNES, GIORGIO ARMANI à LORIENT, GIORGIO ARMANI à PONTIVY, GIORGIO ARMANI à AURAY, GIORGIO ARMANI à LANESTER, GIORGIO ARMANI à METZ, GIORGIO ARMANI à THIONVILLE, GIORGIO ARMANI à CREUTZWALD, GIORGIO ARMANI à SARREGUEMINES, GIORGIO ARMANI à MONDELANGE, GIORGIO ARMANI à SARREBOURG, GIORGIO ARMANI à SAINT AVOLD, GIORGIO ARMANI à FORBACH, GIORGIO ARMANI à BETTING, GIORGIO ARMANI à FREYMING MERLEBACH, GIORGIO ARMANI à MONTIGNY LÈS METZ, GIORGIO ARMANI à NEVERS, GIORGIO ARMANI à MARZY, GIORGIO ARMANI à LILLE, GIORGIO ARMANI à ROUBAIX, GIORGIO ARMANI à LEERS, GIORGIO ARMANI à FLERS EN ESCREBIEUX, GIORGIO ARMANI à WATTIGNIES, GIORGIO ARMANI à DUNKERQUE, GIORGIO ARMANI à FACHES THUMESNIL, GIORGIO ARMANI à LOMME, GIORGIO ARMANI à ESCAUDOEUVRES, GIORGIO ARMANI à HAZEBROUCK, GIORGIO ARMANI à TOURCOING, GIORGIO ARMANI à RONCQ, GIORGIO ARMANI à ARMENTIERES, GIORGIO ARMANI à VALENCIENNES, GIORGIO ARMANI à ENGLOS, GIORGIO ARMANI à HAUTMONT, GIORGIO ARMANI à CAMBRAI, GIORGIO ARMANI à SIN LE NOBLE, GIORGIO ARMANI à PETITE FORET, GIORGIO ARMANI à DOUAI, GIORGIO ARMANI à MAUBEUGE, GIORGIO ARMANI à FOURMIES, GIORGIO ARMANI à VILLENEUVE D'ASCQ, GIORGIO ARMANI à LOUVROIL, GIORGIO ARMANI à GRANDE SYNTHE, GIORGIO ARMANI à BEAUVAIS, GIORGIO ARMANI à CREIL, GIORGIO ARMANI à MERU, GIORGIO ARMANI à NOGENT SUR OISE, GIORGIO ARMANI à COMPIEGNE, GIORGIO ARMANI à CHAMBLY, GIORGIO ARMANI à SENLIS, GIORGIO ARMANI à NOYON, GIORGIO ARMANI à CHANTILLY, GIORGIO ARMANI à CLERMONT, GIORGIO ARMANI à ALENCON, GIORGIO ARMANI à FLERS, GIORGIO ARMANI à ARGENTAN, GIORGIO ARMANI à CONDE SUR SARTHE, GIORGIO ARMANI à ARRAS, GIORGIO ARMANI à CALAIS, GIORGIO ARMANI à BOULOGNE SUR MER, GIORGIO ARMANI à LONGUENESSE, GIORGIO ARMANI à COQUELLES, GIORGIO ARMANI à SAINT MARTIN BOULOGNE, GIORGIO ARMANI à LENS, GIORGIO ARMANI à BETHUNE, GIORGIO ARMANI à SAINT OMER, GIORGIO ARMANI à LE TOUQUET PARIS PLAGE, GIORGIO ARMANI à BERCK SUR MER, GIORGIO ARMANI à BRUAY LA BUISSIERE, GIORGIO ARMANI à NOYELLES GODAULT, GIORGIO ARMANI à CLERMONT FERRAND, GIORGIO ARMANI à CEYRAT, GIORGIO ARMANI à RIOM, GIORGIO ARMANI à ISSOIRE, GIORGIO ARMANI à PAU, GIORGIO ARMANI à BAYONNE, GIORGIO ARMANI à LONS, GIORGIO ARMANI à BIARRITZ, GIORGIO ARMANI à LESCAR, GIORGIO ARMANI à OLORON SAINTE MARIE, GIORGIO ARMANI à SAINT JEAN DE LUZ, GIORGIO ARMANI à ANGLET, GIORGIO ARMANI à TARBES, GIORGIO ARMANI à IBOS, GIORGIO ARMANI à PERPIGNAN, GIORGIO ARMANI à STRASBOURG, GIORGIO ARMANI à GEISPOLSHEIM, GIORGIO ARMANI à MOLSHEIM, GIORGIO ARMANI à ILLKIRCH GRAFFENSTADEN, GIORGIO ARMANI à HAGUENAU, GIORGIO ARMANI à SCHWEIGHOUSE SUR MODER, GIORGIO ARMANI à SELESTAT, GIORGIO ARMANI à SAVERNE, GIORGIO ARMANI à COLMAR, GIORGIO ARMANI à MULHOUSE, GIORGIO ARMANI à ILLZACH, GIORGIO ARMANI à ALTKIRCH, GIORGIO ARMANI à WITTENHEIM, GIORGIO ARMANI à SAINT LOUIS, GIORGIO ARMANI à SIERENTZ, GIORGIO ARMANI à CERNAY, GIORGIO ARMANI à LYON, GIORGIO ARMANI à VILLEUBANNE, GIORGIO ARMANI à VAULX EN VELIN, GIORGIO ARMANI à ECULLY, GIORGIO ARMANI à VENISSIEUX, GIORGIO ARMANI à BELLEVILLE, GIORGIO ARMANI à SAINT GENIS LAVAL, GIORGIO ARMANI à NEUVILLE SUR SAONE, GIORGIO ARMANI à FRANCHEVILLE, GIORGIO ARMANI à VILLEFRANCHE SUR SAONE, GIORGIO ARMANI à DARDILLY, GIORGIO ARMANI à OULLINS, GIORGIO ARMANI à GIVORS, GIORGIO ARMANI à SAINT PRIEST, GIORGIO ARMANI à PUSEY, GIORGIO ARMANI à VESOUL, GIORGIO ARMANI à LURE, GIORGIO ARMANI à LUXEUIL LES BAINS, GIORGIO ARMANI à MACON, GIORGIO ARMANI à CHALON SUR SAONE, GIORGIO ARMANI à MONTCEAU LES MINES, GIORGIO ARMANI à CRECHES SUR SAONE, GIORGIO ARMANI à LE MANS, GIORGIO ARMANI à LA FLECHE, GIORGIO ARMANI à SABLE SUR SARTHE, GIORGIO ARMANI à ARCONNAY, GIORGIO ARMANI à BASSENS, GIORGIO ARMANI à CHAMBERY, GIORGIO ARMANI à AIX LES BAINS, GIORGIO ARMANI à COURCHEVEL SAINT BON, GIORGIO ARMANI à ALBERTVILLE, GIORGIO ARMANI à ANNECY, GIORGIO ARMANI à ANNEMASSE, GIORGIO ARMANI à NEYDENS, GIORGIO ARMANI à THONON LES BAINS, GIORGIO ARMANI à CLUSES, GIORGIO ARMANI à EPAGNY, GIORGIO ARMANI à EVIAN LES BAINS, GIORGIO ARMANI à SEYNOD, GIORGIO ARMANI à PARIS, GIORGIO ARMANI à ROUEN, GIORGIO ARMANI à LE GRAND QUEVILLY, GIORGIO ARMANI à YVETOT, GIORGIO ARMANI à DIEPPE, GIORGIO ARMANI à BOLBEC, GIORGIO ARMANI à MONTIVILLIERS, GIORGIO ARMANI à BARENTIN, GIORGIO ARMANI à FECAMP, GIORGIO ARMANI à TOURVILLE LA RIVIERE, GIORGIO ARMANI à ELBEUF, GIORGIO ARMANI à LE HAVRE, GIORGIO ARMANI à GONFREVILLE L'ORCHER, GIORGIO ARMANI à MELUN, GIORGIO ARMANI à COLLEGIEN, GIORGIO ARMANI à MEAUX, GIORGIO ARMANI à COULOMMIERS, GIORGIO ARMANI à LIEUSAINT, GIORGIO ARMANI à NEMOURS, GIORGIO ARMANI à VILLIERS EN BIERE, GIORGIO ARMANI à CESSON, GIORGIO ARMANI à FONTAINEBLEAU, GIORGIO ARMANI à PONTAULT COMBAULT, GIORGIO ARMANI à CLAYE SOUILLY, GIORGIO ARMANI à CHAMPS SUR MARNE, GIORGIO ARMANI à CHELLES, GIORGIO ARMANI à SERRIS, GIORGIO ARMANI à VERSAILLES, GIORGIO ARMANI à SAINT GERMAIN EN LAYE, GIORGIO ARMANI à RAMBOUILLET, GIORGIO ARMANI à VELIZY VILLACOUBLAY, GIORGIO ARMANI à LE CHESNAY, GIORGIO ARMANI à MARLY LE ROI, GIORGIO ARMANI à MONTIGNY LE BRETONNEUX, GIORGIO ARMANI à MANTES LA JOLIE, GIORGIO ARMANI à CHAMBOURCY, GIORGIO ARMANI à MEULAN, GIORGIO ARMANI à ACHERES, GIORGIO ARMANI à POISSY, GIORGIO ARMANI à MONTESSON, GIORGIO ARMANI à PLAISIR, GIORGIO ARMANI à BOIS D'ARCY, GIORGIO ARMANI à AUBERGENVILLE, GIORGIO ARMANI à SARTROUVILLE, GIORGIO ARMANI à VERNOUILLET, GIORGIO ARMANI à MAISONS LAFFITTE, GIORGIO ARMANI à ORGEVAL, GIORGIO ARMANI à CONFLANS SAINTE HONORINE, GIORGIO ARMANI à HOUILLES, GIORGIO ARMANI à NIORT, GIORGIO ARMANI à SAINTE VERGE, GIORGIO ARMANI à CHAURAY, GIORGIO ARMANI à BRESSUIRE, GIORGIO ARMANI à AMIENS, GIORGIO ARMANI à ABBEVILLE, GIORGIO ARMANI à MERS LES BAINS, GIORGIO ARMANI à GLISY, GIORGIO ARMANI à DURY, GIORGIO ARMANI à ALBI, GIORGIO ARMANI à CASTRES, GIORGIO ARMANI à MAZAMET, GIORGIO ARMANI à MONTAUBAN, GIORGIO ARMANI à MOISSAC, GIORGIO ARMANI à TOULON, GIORGIO ARMANI à LA GARDE, GIORGIO ARMANI à LA VALETTE DU VAR, GIORGIO ARMANI à CAVALAIRE SUR MER, GIORGIO ARMANI à DRAGUIGNAN, GIORGIO ARMANI à HYERES, GIORGIO ARMANI à LA SEYNE SUR MER, GIORGIO ARMANI à GASSIN, GIORGIO ARMANI à SAINT RAPHAEL, GIORGIO ARMANI à TRANS EN PROVENCE, GIORGIO ARMANI à SAINT TROPEZ, GIORGIO ARMANI à AVIGNON, GIORGIO ARMANI à ORANGE, GIORGIO ARMANI à PERTUIS, GIORGIO ARMANI à LE PONTET, GIORGIO ARMANI à CAVAILLON, GIORGIO ARMANI à BOLLENE, GIORGIO ARMANI à L'ISLE SUR LA SORGUE, GIORGIO ARMANI à LA ROCHE SUR YON, GIORGIO ARMANI à LES SABLES D'OLONNE, GIORGIO ARMANI à CHANTONNAY, GIORGIO ARMANI à FONTENAY LE COMTE, GIORGIO ARMANI à CHALLANS, GIORGIO ARMANI à LES HERBIERS, GIORGIO ARMANI à MONTAIGU, GIORGIO ARMANI à SAINT GILLES CROIX DE VIE, GIORGIO ARMANI à POITIERS, GIORGIO ARMANI à CHATELLERAULT, GIORGIO ARMANI à CHASSENEUIL DU POITOU, GIORGIO ARMANI à LIMOGES, GIORGIO ARMANI à SAINT JUNIEN, GIORGIO ARMANI à BOISSEUIL, GIORGIO ARMANI à EPINAL, GIORGIO ARMANI à SAINT DIE DES VOSGES, GIORGIO ARMANI à VITTEL, GIORGIO ARMANI à AUXERRE, GIORGIO ARMANI à SENS, GIORGIO ARMANI à BELFORT, GIORGIO ARMANI à BESSONCOURT, GIORGIO ARMANI à EVRY, GIORGIO ARMANI à CORBEIL ESSONNES, GIORGIO ARMANI à VILLEBON SUR YVETTE, GIORGIO ARMANI à ETAMPES, GIORGIO ARMANI à LONGJUMEAU, GIORGIO ARMANI à VIRY CHATILLON, GIORGIO ARMANI à ATHIS MONS, GIORGIO ARMANI à BRETIGNY SUR ORGE, GIORGIO ARMANI à MONTGERON, GIORGIO ARMANI à JUVISY SUR ORGE, GIORGIO ARMANI à VIGNEUX SUR SEINE, GIORGIO ARMANI à MASSY, GIORGIO ARMANI à EPINAY SUR ORGE, GIORGIO ARMANI à VERRIERES LE BUISSON, GIORGIO ARMANI à CHILLY MAZARIN, GIORGIO ARMANI à ORSAY, GIORGIO ARMANI à MENNECY, GIORGIO ARMANI à LA VILLE DU BOIS, GIORGIO ARMANI à BOUSSY SAINT ANTOINE, GIORGIO ARMANI à LES ULIS, GIORGIO ARMANI à BOULOGNE BILLANCOURT, GIORGIO ARMANI à CLICHY, GIORGIO ARMANI à ISSY LES MOULINEAUX, GIORGIO ARMANI à CLAMART, GIORGIO ARMANI à SURESNES, GIORGIO ARMANI à ANTONY, GIORGIO ARMANI à NEUILLY SUR SEINE, GIORGIO ARMANI à SAINT CLOUD, GIORGIO ARMANI à LA GARENNE COLOMBES, GIORGIO ARMANI à FONTENAY AUX ROSES, GIORGIO ARMANI à BOIS COLOMBES, GIORGIO ARMANI à LEVALLOIS PERRET, GIORGIO ARMANI à SCEAUX, GIORGIO ARMANI à BOURG LA REINE, GIORGIO ARMANI à LE PLESSIS ROBINSON, GIORGIO ARMANI à MEUDON LA FORET, GIORGIO ARMANI à GARCHES, GIORGIO ARMANI à COURBEVOIE, GIORGIO ARMANI à ASNIERES SUR SEINE, GIORGIO ARMANI à COLOMBES, GIORGIO ARMANI à PUTEAUX, GIORGIO ARMANI à BOBIGNY, GIORGIO ARMANI à MONTREUIL, GIORGIO ARMANI à ROSNY SOUS BOIS, GIORGIO ARMANI à NOISY LE GRAND, GIORGIO ARMANI à BAGNOLET, GIORGIO ARMANI à SAINT DENIS, GIORGIO ARMANI à LES LILAS, GIORGIO ARMANI à SEVRAN, GIORGIO ARMANI à TREMBLAY EN FRANCE, GIORGIO ARMANI à AUBERVILLIERS, GIORGIO ARMANI à CLICHY SOUS BOIS, GIORGIO ARMANI à PANTIN, GIORGIO ARMANI à AULNAY SOUS BOIS, GIORGIO ARMANI à DRANCY, GIORGIO ARMANI à EPINAY SUR SEINE, GIORGIO ARMANI à CRETEIL, GIORGIO ARMANI à ARCUEIL, GIORGIO ARMANI à FONTENAY SOUS BOIS, GIORGIO ARMANI à IVRY SUR SEINE, GIORGIO ARMANI à CHARENTON LE PONT, GIORGIO ARMANI à LE KREMLIN BICETRE, GIORGIO ARMANI à VINCENNES, GIORGIO ARMANI à ORLY, GIORGIO ARMANI à THIAIS, GIORGIO ARMANI à JOINVILLE LE PONT, GIORGIO ARMANI à BRY SUR MARNE, GIORGIO ARMANI à VILLEJUIF, GIORGIO ARMANI à CERGY, GIORGIO ARMANI à ARGENTEUIL, GIORGIO ARMANI à ERMONT, GIORGIO ARMANI à FRANCONVILLE, GIORGIO ARMANI à GARGES LES GONESSE, GIORGIO ARMANI à TAVERNY, GIORGIO ARMANI à SARCELLES, GIORGIO ARMANI à L'ISLE ADAM, GIORGIO ARMANI à SAINT BRICE SOUS FORET, GIORGIO ARMANI à MONTIGNY LES CORMEILLES, GIORGIO ARMANI à OSNY, GIORGIO ARMANI à ERAGNY SUR OISE, GIORGIO ARMANI à ROISSY EN FRANCE, GIORGIO ARMANI à ENGHIEN LES BAINS, GIORGIO ARMANI à PRINCIPAUTE DE MONACO - GIORGIO ARMANI à STRASBOURG, GIORGIO ARMANI à BORDEAUX, GIORGIO ARMANI à CLERMONT-FERRAND, GIORGIO ARMANI à CAEN, GIORGIO ARMANI à DIJON, GIORGIO ARMANI à RENNES, GIORGIO ARMANI à ORLÉANS, GIORGIO ARMANI à BESANÇON, GIORGIO ARMANI à ROUEN, GIORGIO ARMANI à PARIS, GIORGIO ARMANI à MONTPELLIER, GIORGIO ARMANI à LIMOGES, GIORGIO ARMANI à METZ, GIORGIO ARMANI à TOULOUSE, GIORGIO ARMANI à LILLE, GIORGIO ARMANI à NANTES, GIORGIO ARMANI à AMIENS, GIORGIO ARMANI à POITIERS, GIORGIO ARMANI à MARSEILLE, GIORGIO ARMANI à LYON, GIORGIO ARMANI à HAGUENAU, GIORGIO ARMANI à MOLSHEIM, GIORGIO ARMANI à SAVERNE, GIORGIO ARMANI à SÉLESTAT, GIORGIO ARMANI à WISSEMBOURG, GIORGIO ARMANI à COLMAR, GIORGIO ARMANI à ALTKIRCH, GIORGIO ARMANI à GUEBWILLER, GIORGIO ARMANI à MULHOUSE, GIORGIO ARMANI à RIBEAUVILLÉ, GIORGIO ARMANI à THANN, GIORGIO ARMANI à PÉRIGUEUX, GIORGIO ARMANI à BERGERAC, GIORGIO ARMANI à NONTRON, GIORGIO ARMANI à SARLAT-LA-CANÉDA, GIORGIO ARMANI à ARCACHON, GIORGIO ARMANI à BLAYE, GIORGIO ARMANI à LANGON, GIORGIO ARMANI à LESPARRE-MÉDOC, GIORGIO ARMANI à LIBOURNE, GIORGIO ARMANI à MONT-DE-MARSAN, GIORGIO ARMANI à DAX, GIORGIO ARMANI à AGEN, GIORGIO ARMANI à MARMANDE, GIORGIO ARMANI à NÉRAC, GIORGIO ARMANI à VILLENEUVE-SUR-LOT, GIORGIO ARMANI à PAU, GIORGIO ARMANI à BAYONNE, GIORGIO ARMANI à OLORON-SAINTE-MARIE, GIORGIO ARMANI à MOULINS, GIORGIO ARMANI à MONTLUÇON, GIORGIO ARMANI à VICHY, GIORGIO ARMANI à AURILLAC, GIORGIO ARMANI à MAURIAC, GIORGIO ARMANI à SAINT-FLOUR, GIORGIO ARMANI à LE PUY-EN-VELAY, GIORGIO ARMANI à BRIOUDE, GIORGIO ARMANI à YSSINGEAUX, GIORGIO ARMANI à AMBERT, GIORGIO ARMANI à ISSOIRE, GIORGIO ARMANI à RIOM, GIORGIO ARMANI à THIERS, GIORGIO ARMANI à BAYEUX, GIORGIO ARMANI à LISIEUX, GIORGIO ARMANI à VIRE, GIORGIO ARMANI à SAINT-LÔ, GIORGIO ARMANI à AVRANCHES, GIORGIO ARMANI à CHERBOURG-OCTEVILLE, GIORGIO ARMANI à COUTANCES, GIORGIO ARMANI à ALENÇON, GIORGIO ARMANI à ARGENTAN, GIORGIO ARMANI à MORTAGNE-AU-PERCHE, GIORGIO ARMANI à BEAUNE, GIORGIO ARMANI à MONTBARD, GIORGIO ARMANI à NEVERS, GIORGIO ARMANI à CHÂTEAU-CHINON, GIORGIO ARMANI à CLAMECY, GIORGIO ARMANI à COSNE-COURS-SUR-LOIRE, GIORGIO ARMANI à MÂCON, GIORGIO ARMANI à AUTUN, GIORGIO ARMANI à CHALON-SUR-SAÔNE, GIORGIO ARMANI à CHAROLLES, GIORGIO ARMANI à LOUHANS, GIORGIO ARMANI à AUXERRE, GIORGIO ARMANI à AVALLON, GIORGIO ARMANI à SENS, GIORGIO ARMANI à SAINT-BRIEUC, GIORGIO ARMANI à DINAN, GIORGIO ARMANI à GUINGAMP, GIORGIO ARMANI à LANNION, GIORGIO ARMANI à QUIMPER, GIORGIO ARMANI à BREST, GIORGIO ARMANI à CHÂTEAULIN, GIORGIO ARMANI à MORLAIX, GIORGIO ARMANI à FOUGÈRES, GIORGIO ARMANI à REDON, GIORGIO ARMANI à SAINT-MALO, GIORGIO ARMANI à VANNES, GIORGIO ARMANI à LORIENT, GIORGIO ARMANI à PONTIVY, GIORGIO ARMANI à BOURGES, GIORGIO ARMANI à SAINT-AMAND-MONTROND, GIORGIO ARMANI à VIERZON, GIORGIO ARMANI à CHARTRES, GIORGIO ARMANI à CHÂTEAUDUN, GIORGIO ARMANI à DREUX, GIORGIO ARMANI à NOGENT-LE-ROTROU, GIORGIO ARMANI à CHÂTEAUROUX, GIORGIO ARMANI à LE BLANC, GIORGIO ARMANI à LA CHÂTRE, GIORGIO ARMANI à ISSOUDUN, GIORGIO ARMANI à TOURS, GIORGIO ARMANI à CHINON, GIORGIO ARMANI à LOCHES, GIORGIO ARMANI à BLOIS, GIORGIO ARMANI à ROMORANTIN-LANTHENAY, GIORGIO ARMANI à VENDÔME, GIORGIO ARMANI à MONTARGIS, GIORGIO ARMANI à PITHIVIERS, GIORGIO ARMANI à CHARLEVILLE-MÉZIÈRES, GIORGIO ARMANI à RETHEL, GIORGIO ARMANI à SEDAN, GIORGIO ARMANI à VOUZIERS, GIORGIO ARMANI à TROYES, GIORGIO ARMANI à BAR-SUR-AUBE, GIORGIO ARMANI à NOGENT-SUR-SEINE, GIORGIO ARMANI à CHÂLONS-EN-CHAMPAGNE, GIORGIO ARMANI à ÉPERNAY, GIORGIO ARMANI à REIMS, GIORGIO ARMANI à SAINTE-MENEHOULD, GIORGIO ARMANI à VITRY-LE-FRANÇOIS, GIORGIO ARMANI à CHAUMONT, GIORGIO ARMANI à LANGRES, GIORGIO ARMANI à SAINT-DIZIER, GIORGIO ARMANI à MONTBÉLIARD, GIORGIO ARMANI à PONTARLIER, GIORGIO ARMANI à LONS-LE-SAUNIER, GIORGIO ARMANI à DOLE, GIORGIO ARMANI à SAINT-CLAUDE, GIORGIO ARMANI à VESOUL, GIORGIO ARMANI à LURE, GIORGIO ARMANI à BELFORT, GIORGIO ARMANI à ÉVREUX, GIORGIO ARMANI à LES ANDELYS, GIORGIO ARMANI à BERNAY, GIORGIO ARMANI à DIEPPE, GIORGIO ARMANI à LE HAVRE, GIORGIO ARMANI à MELUN, GIORGIO ARMANI à FONTAINEBLEAU, GIORGIO ARMANI à MEAUX, GIORGIO ARMANI à PROVINS, GIORGIO ARMANI à TORCY, GIORGIO ARMANI à VERSAILLES, GIORGIO ARMANI à MANTES-LA-JOLIE, GIORGIO ARMANI à RAMBOUILLET, GIORGIO ARMANI à SAINT-GERMAIN-EN-LAYE, GIORGIO ARMANI à ÉVRY, GIORGIO ARMANI à ÉTAMPES, GIORGIO ARMANI à PALAISEAU, GIORGIO ARMANI à NANTERRE, GIORGIO ARMANI à ANTONY, GIORGIO ARMANI à BOULOGNE-BILLANCOURT, GIORGIO ARMANI à BOBIGNY, GIORGIO ARMANI à LE RAINCY, GIORGIO ARMANI à SAINT-DENIS, GIORGIO ARMANI à CRÉTEIL, GIORGIO ARMANI à L'HAÿ-LES-ROSES, GIORGIO ARMANI à NOGENT-SUR-MARNE, GIORGIO ARMANI à PONTOISE, GIORGIO ARMANI à ARGENTEUIL, GIORGIO ARMANI à SARCELLES, GIORGIO ARMANI à CARCASSONNE, GIORGIO ARMANI à LIMOUX, GIORGIO ARMANI à NARBONNE, GIORGIO ARMANI à NÎMES, GIORGIO ARMANI à ALÈS, GIORGIO ARMANI à LE VIGAN, GIORGIO ARMANI à BÉZIERS, GIORGIO ARMANI à LODÈVE, GIORGIO ARMANI à MENDE, GIORGIO ARMANI à FLORAC, GIORGIO ARMANI à PERPIGNAN, GIORGIO ARMANI à CÉRET, GIORGIO ARMANI à PRADES, GIORGIO ARMANI à TULLE, GIORGIO ARMANI à BRIVE-LA-GAILLARDE, GIORGIO ARMANI à USSEL, GIORGIO ARMANI à GUÉRET, GIORGIO ARMANI à AUBUSSON, GIORGIO ARMANI à BELLAC, GIORGIO ARMANI à ROCHECHOUART, GIORGIO ARMANI à NANCY, GIORGIO ARMANI à BRIEY, GIORGIO ARMANI à LUNÉVILLE, GIORGIO ARMANI à TOUL, GIORGIO ARMANI à BOULAY-MOSELLE, GIORGIO ARMANI à CHÂTEAU-SALINS, GIORGIO ARMANI à FORBACH, GIORGIO ARMANI à SARREBOURG, GIORGIO ARMANI à SARREGUEMINES, GIORGIO ARMANI à THIONVILLE, GIORGIO ARMANI à ÉPINAL, GIORGIO ARMANI à NEUFCHÂTEAU, GIORGIO ARMANI à SAINT-DIÉ-DES-VOSGES, GIORGIO ARMANI à FOIX, GIORGIO ARMANI à PAMIERS, GIORGIO ARMANI à SAINT-GIRONS, GIORGIO ARMANI à RODEZ, GIORGIO ARMANI à MILLAU, GIORGIO ARMANI à VILLEFRANCHE-DE-ROUERGUE, GIORGIO ARMANI à MURET, GIORGIO ARMANI à SAINT-GAUDENS, GIORGIO ARMANI à AUCH, GIORGIO ARMANI à CONDOM, GIORGIO ARMANI à MIRANDE, GIORGIO ARMANI à CAHORS, GIORGIO ARMANI à FIGEAC, GIORGIO ARMANI à GOURDON, GIORGIO ARMANI à TARBES, GIORGIO ARMANI à ARGELÈS-GAZOST, GIORGIO ARMANI à BAGNÈRES-DE-BIGORRE, GIORGIO ARMANI à ALBI, GIORGIO ARMANI à CASTRES, GIORGIO ARMANI à MONTAUBAN, GIORGIO ARMANI à CASTELSARRASIN, GIORGIO ARMANI à AVESNES-SUR-HELPE, GIORGIO ARMANI à CAMBRAI, GIORGIO ARMANI à DOUAI, GIORGIO ARMANI à DUNKERQUE, GIORGIO ARMANI à VALENCIENNES, GIORGIO ARMANI à ARRAS, GIORGIO ARMANI à BÉTHUNE, GIORGIO ARMANI à BOULOGNE-SUR-MER, GIORGIO ARMANI à CALAIS, GIORGIO ARMANI à LENS, GIORGIO ARMANI à MONTREUIL-SUR-MER, GIORGIO ARMANI à SAINT-OMER, GIORGIO ARMANI à ANCENIS, GIORGIO ARMANI à CHÂTEAUBRIANT, GIORGIO ARMANI à SAINT-NAZAIRE, GIORGIO ARMANI à ANGERS, GIORGIO ARMANI à CHOLET, GIORGIO ARMANI à SAUMUR, GIORGIO ARMANI à SEGRÉ, GIORGIO ARMANI à LAVAL, GIORGIO ARMANI à CHÂTEAU-GONTIER, GIORGIO ARMANI à MAYENNE, GIORGIO ARMANI à LE MANS, GIORGIO ARMANI à LA FLÈCHE, GIORGIO ARMANI à MAMERS, GIORGIO ARMANI à LA ROCHE-SUR-YON, GIORGIO ARMANI à FONTENAY-LE-COMTE, GIORGIO ARMANI à LES SABLES-D'OLONNE, GIORGIO ARMANI à LAON, GIORGIO ARMANI à CHÂTEAU-THIERRY, GIORGIO ARMANI à SAINT-QUENTIN, GIORGIO ARMANI à SOISSONS, GIORGIO ARMANI à VERVINS, GIORGIO ARMANI à BEAUVAIS, GIORGIO ARMANI à CLERMONT, GIORGIO ARMANI à COMPIÈGNE, GIORGIO ARMANI à SENLIS, GIORGIO ARMANI à ABBEVILLE, GIORGIO ARMANI à MONTDIDIER, GIORGIO ARMANI à PÉRONNE, GIORGIO ARMANI à ANGOULÊME, GIORGIO ARMANI à COGNAC, GIORGIO ARMANI à CONFOLENS, GIORGIO ARMANI à LA ROCHELLE, GIORGIO ARMANI à JONZAC, GIORGIO ARMANI à ROCHEFORT, GIORGIO ARMANI à SAINTES, GIORGIO ARMANI à SAINT-JEAN-D'ANGÉLY, GIORGIO ARMANI à NIORT, GIORGIO ARMANI à BRESSUIRE, GIORGIO ARMANI à PARTHENAY, GIORGIO ARMANI à CHÂTELLERAULT, GIORGIO ARMANI à MONTMORILLON, GIORGIO ARMANI à DIGNE-LES-BAINS, GIORGIO ARMANI à BARCELONNETTE, GIORGIO ARMANI à CASTELLANE, GIORGIO ARMANI à FORCALQUIER, GIORGIO ARMANI à GAP, GIORGIO ARMANI à BRIANÇON, GIORGIO ARMANI à NICE, GIORGIO ARMANI à GRASSE, GIORGIO ARMANI à AIX-EN-PROVENCE, GIORGIO ARMANI à ARLES, GIORGIO ARMANI à ISTRES, GIORGIO ARMANI à TOULON, GIORGIO ARMANI à BRIGNOLES, GIORGIO ARMANI à DRAGUIGNAN, GIORGIO ARMANI à AVIGNON, GIORGIO ARMANI à APT, GIORGIO ARMANI à CARPENTRAS, GIORGIO ARMANI à BOURG-EN-BRESSE, GIORGIO ARMANI à BELLEY, GIORGIO ARMANI à GEX, GIORGIO ARMANI à NANTUA, GIORGIO ARMANI à PRIVAS, GIORGIO ARMANI à LARGENTIÈRE, GIORGIO ARMANI à TOURNON-SUR-RHÔNE, GIORGIO ARMANI à VALENCE, GIORGIO ARMANI à DIE, GIORGIO ARMANI à NYONS, GIORGIO ARMANI à GRENOBLE, GIORGIO ARMANI à LA TOUR-DU-PIN, GIORGIO ARMANI à VIENNE, GIORGIO ARMANI à SAINT-ÉTIENNE, GIORGIO ARMANI à MONTBRISON, GIORGIO ARMANI à ROANNE, GIORGIO ARMANI à VILLEFRANCHE-SUR-SAÔNE, GIORGIO ARMANI à CHAMBÉRY, GIORGIO ARMANI à ALBERTVILLE, GIORGIO ARMANI à SAINT-JEAN-DE-MAURIENNE, GIORGIO ARMANI à ANNECY, GIORGIO ARMANI à BONNEVILLE, GIORGIO ARMANI à SAINT-JULIEN-EN-GENEVOIS, GIORGIO ARMANI à THONON-LES-BAINS - acheter GIORGIO ARMANI - vendre GIORGIO ARMANI - achat GIORGIO ARMANI - vente GIORGIO ARMANI.